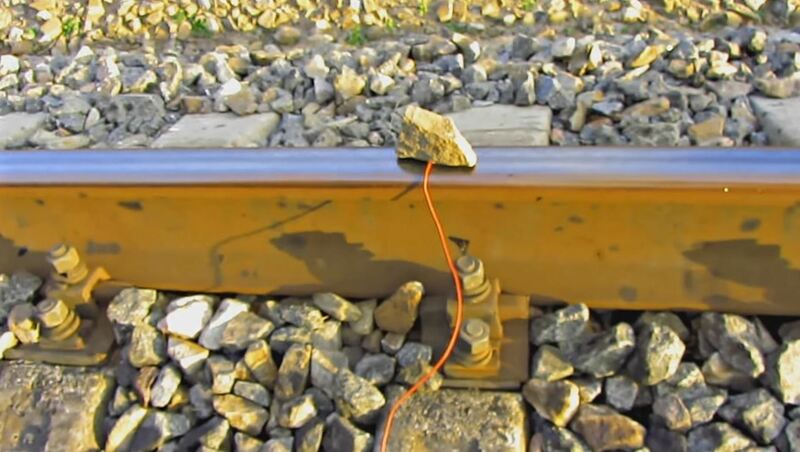 Some train tracks carry a small electric charge as a means of detecting other trains for signaling or for detecting blockages; a metallic object lain across the rails will complete a current, and will alert the rail company that there is a potential obstruction. So if you're ever in a bind and need some help asap, you can lay a metallic object across the tracks, or connect them together with some scrap wire or jumper cables. The company should be able to track your "blockage" to within two miles, and will send out a maintenance worker to investigate, or a train might arrive at very low speed. And if you happen to have a few electrical components around (that you can scavenge from old cars or abandoned buildings), you can maybe even charge that dead cell phone battery of yours instead, as YouTube kreosan shows below. Do not do this unless you are absolutely in danger. Trespassing on train tracks is illegal. If someone catches you fooling around on the tracks just to charge a smartphone, you're gonna be hit with a hefty fine at the very least. Connecting the rails together could also be seriously dangerous if any nearby trains are already approaching at high speeds, as any people onboard could abandon "ship." Trespassing on train tracks is also very dangerous, because you could be hit by a train, and you probably don't want to be hit by a train. First things first, if you've got a voltmeter, you're going to want to use that to see if the tracks are carrying a charge. If they aren't, this method isn't going to work. The voltage from the tracks should be pretty low, so you won't need to solder the connections, but it won't hurt if you're able to. Also, if you roam the countryside with a soldering iron in tow, you probably know a thing or two about what we're doing here. You'll need to cut off the USB/plug end of your charging cable, separate the two wires, and strip back the sheath on both. You'll need to strip off the sheaths on both ends of each of the track wires, as well. 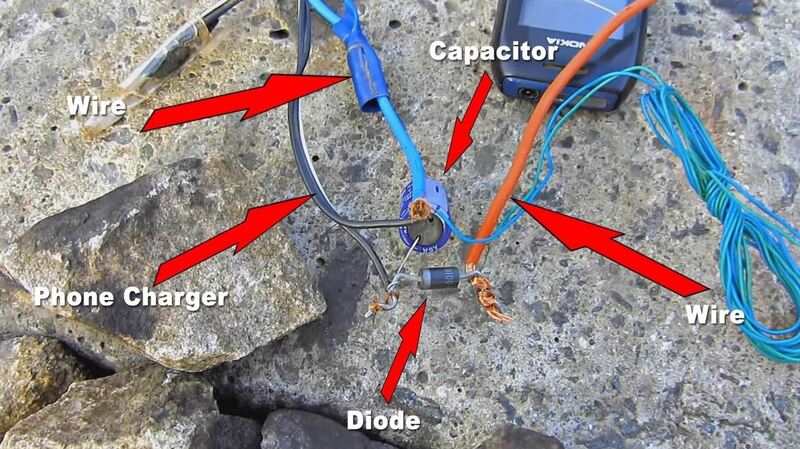 You're going to connect one of your track wires to one end of the diode; on the other end of the diode, connect one of the cell phone charger wires, along with one of the leads from the capacitor. If the capacitor has a polarity, make sure to mount it with the diode negative-to-negative, or positive-to-positive. Now all you have to do is put one track wire on each track, and weigh them down with a rock to keep them on the rail, and you should have a completed circuit. If the track is all rusted, it probably won't work, and probably means no trains run there anymore, hence no need for a track circuit with any voltage. If there's a shiny section, that will mean it's still in use and could have voltage on the rail, and that's where you want to make the connection. Now all that's left to do is plug in your phone, and it should start to charge. It won't charge super fast or anything (it will probably charge even slower, realistically), but it could give you enough juice to make an emergency call hopefully. 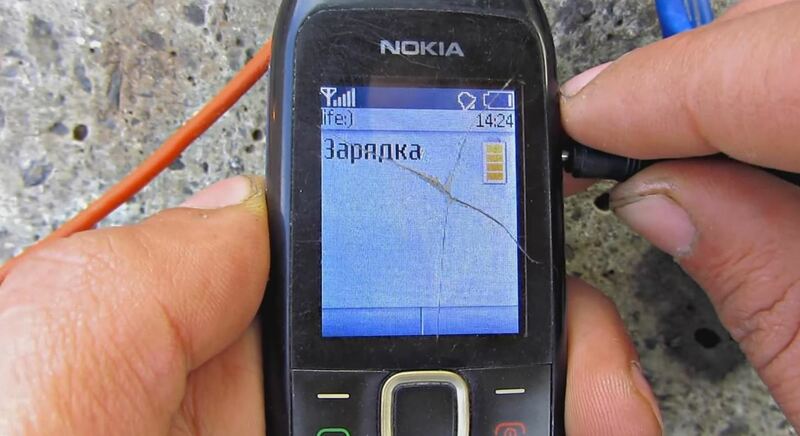 This trick could really come in handy if you're lost somewhere with a dead cell phone and you need help. Once again, though, don't do this unless it's a real emergency. Railways are private property, and the authorities treat trespassing very seriously. Yeah, 'cause someone seeing a cell phone attached by wires to the tracks won't make them think IED...hope anyone trying this gets charged with domestic terrorism and has a very expensive time in court pleading down to only criminal trespass.